This year’s Wine Walk will take place at Blue Hole Regional Park. We will host wineries, food trucks and live music for you to enjoy! As always we will provide you with a souvenir drinking cup for your tastings – food will be an additional cost. Tickets for the Wine Walk are $45 and may be purchased at the door on a first come first serve basis. Everyone attending must have a ticket this year. 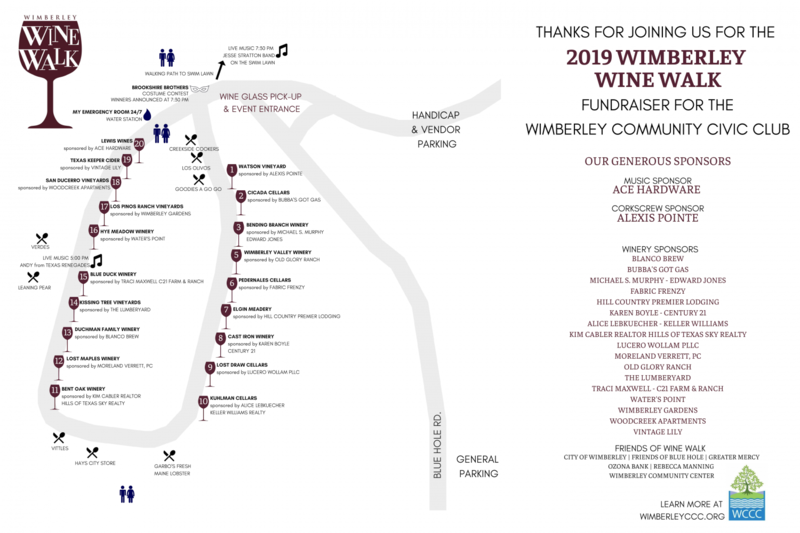 The Wimberley Wine Walk is an event of The Wimberley Community Civic Club. Click to visit the WCCC page and learn more about our organization.